Rolling doors are ideal when you have limited headroom or obstructions above and over your opening. Rolling doors have been known to be the most durable, rugged, reliable commercial doors in our industry. They are not known for their insulating properties, but you will be hard pressed to find a more durable door. 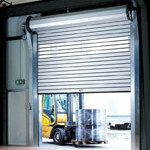 Call today about installing or servicing rolling doors and operators. Rolling fire doors and shutters are to limit damage by dividing one area from the next in the event of fire. These doors / shutters are available with many “drop” options like: smoke detectors and fusible links. * Ask about our Auto-Reset and Easy Reset Systems. **Do I need my fire doors tested? I need the annual inspection / testing of our fire doors and shutters to comply with NFPA 80 Building Code. Rolling shutters are used in a variety of applications. Typically, they are utilized over a “counter”, as they are smaller in height and used in a more “retail” environment. 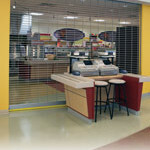 Counter shutters are available in wood, steel and aluminum. A wide choice of colors are available. You can motorize or opt for the manual hand crank, if the shutter is too large to push up and pull down. 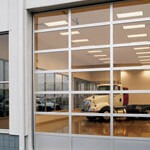 Ohio commercial doors, as well as parts and commercial door operators. fire door testing, and commercial door repair in Akron, Cleveland, and Canton. Call us today to discuss how we can meet your establishment’s needs. Our highly experienced staff is here to help. Our number is 866-366-7463 or visit our locations page for additional numbers and a location near you. Action Door offers commercial doors from Wayne-Dalton. Wayne-Dalton is a leading manufacturer of safe, high-quality doors. Since 1954, Wayne-Dalton has been successful in creating innovative products that are both safe and durable. Action Door is proud to offer well-built products such as these, made by well-established manufacturers like Wayne-Dalton and continues to strive for better products from better companies.